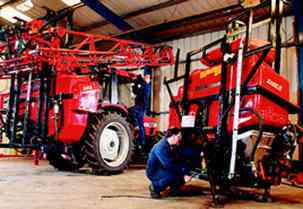 Polydon’s purpose built assembly shop can efficiently handle hydraulic, electrical and mechanical assembly of a wide range of work including automotive agricultural and even the exacting standards required by the aviation industry. From small electrical control boxes to a 10 ton self- propelled vehicle, Polydon can accomodate your needs. Manufacturing in-house hydraulic and pneumatic hoses and assemblies, which are tested at all required stages, including system testing after final product assembly. Bolting, rivetting or glueing enclosures to structural fabrication, our mech- anical fitters can handle all sizes and quantities. A full electrical service is available creating control boxes, full wiring looms in low voltage, 240 volts and 3 phase. We at Polydon can assemble what you the customer require.